Add to My Favorite Store. 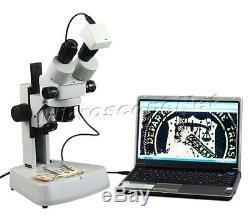 Binocular 3.5x90x Zoom Stereo Microscope with 1.3MP Digital Camera. Dual halogen illuminators --- adjustable light intensity & inclined angle. Wide field eyepieces WF10X/20 and WF20X/10. With 0.5X auxiliary objective. 1.3MP digital camera included. Plug and see, no special knowledge needed. Top quality optical glass elements. Zoom lenses 3.5x90x, crystal clear within any range. Wide field eyepieces: WF10X/20 and WF20X/10. 0.5X auxiliary objective (D50mm). 1280x1024 (1.3MP) high resolution digital camera with 0.45x reduction lens to get larger field of view. High speed USB 2.0 connection with computers. Compatible with Windows, Mac OS X, and Linux (see version information below). Long working distance allows enough operation space. Individual adjustable intensity incident and transmitted lights. Upper (incident) light has 90° inclination range. Sharp erect stereo images over a wide field view. Both ocular tubes have diopter adjustment. Adjustable inter-pupillary distance to fit anyone's eyes. Tool-free focus knob tension adjustment. Product GS and CE approved. Eyepieces: wide field WF10X/20 and WF20X/10. 0.5X auxiliary objective (mount thread: 50mm in diameter). Zoom ratio: 6.5:1. Objective zoom: 0.7x4.5x. Both ocular tubes have diopter adjustment ±5dp. Interpupillary distance: 2-3/16" 2-15/16"(5575mm). Working distance: 3-3/4" (95mm) without 0.5x auxiliary lens and 6-1/2" (165mm) with 0.5x auxiliary lens. Focus adjustment stroke: 5-1/5 (140mm). Incident (upper) illuminator: 12V/10W halogen, 90°adjustable inclined angle range. Transmitted (lower) illuminator: 12V/10W halogen. Each light has its own intensity control with power on/off switch. High resolution digital camera: color 1280x1024 pixels. Platform compatiblity of camera: Windows, Mac OS X, Linux (see version information below). Auxiliary objective thread: 50mm in diameter. Clear glass stage plate: 3-3/4 (95mm) in diameter. White/black plastic stage plate: 3-3/4 (95mm) in diameter. Dimension: 10" x 10" x 18 (25.4cmx25.4cmx46cm). Net weight: 12 lb (5.4kg). Package volume equivalent weight: 32 lb (14.4kg). Please check the chart below for computer operating system compatibility. 0.5X auxiliary objective(D50mm). Black/white high quality plastic stage plate. USB 2.0 digital camera 1280x1024 with 0.5x built-in reduction lens. 1CD including drivers and software. 6 foot USB 2.0 cord. A pack of lens cleaning paper. Extra halogen bulb 12V/10W with reflector. Digital camera adapters (Nikon, Olympus, Canon, Ricoh). Spare halogen bulb 12V/10W with reflector. A: We are happy to leave feedback for our customers once we have been paid and the item has been delivered to the carrier. We would appreciate that once you receive your item, you also leave us feedback. If you feel that you cannot leave a Positive comment with all 5 stars - WE WILL EARN IT. We are here to exceed your expectations! The item "Large Binocular Stereo Zoom Microscope 3.5X-90X with 1.3MP USB Camera" is in sale since Tuesday, August 09, 2016. This item is in the category "Business & Industrial\Manufacturing & Metalworking\Semiconductor & PCB Equipment\Inspection Equipment".